The European Space Agency's Rosetta spacecraft will finally complete its 10 year journey to intercept the comet 67P/Churyumov–Gerasimenko on Wednesday. Now comes the hard part. The Rosetta spacecraft is currently travelling at about 36,000 mph—that's roughly mach 47. Comet 67P, meanwhile, is moving through space at 34,175 mph. 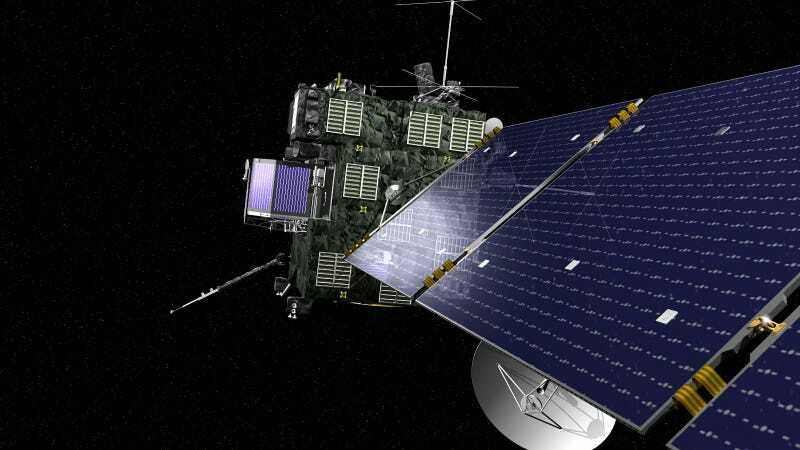 In order for the Rosetta to intercept and enter orbit around the comet, it's going to have to match the comet's speed within a range of just 1 mph. So, to slow itself down sufficiently, the Rosetta performed a series of thruster burns in June and July to cut 1500 mph off its trajectory, while another pair of "insertion burns" performed yesterday and today should put the spacecraft in optimal position to snag the passing space rock.